... ninjutsu does not depend on one's size, speed, or strength to win. Unlike most of the more conventional martial arts available today like Karate, Tae Kwon Do, and Judo, Ninjutsu has no sport or competition aspects. It was originally developed for, and continues to focus on, real-world self-protection. ... in a world where criminals, muggers, and other assailants choose their victims precisely because of this disadvantage, the student of ninjutsu can be confident that he or she can rely on their martial art. ... you can be sure that what we're teaching works, because it has worked again and again in a real life-saving situation - not in a karate tournament. ... options are the key to success. The more options you have - the more flexible you are - the greater your chances of not only surviving, but winning! ... your assailant is already operating 'outside' of these rules. They are already not "fighting-fair" and will do everything in their power to, not only win but, crush and humiliate you. ... today's legal system is pro-criminal! Only when there is no recourse does the practitioner of ninjutsu engage in physically fighting with an aggressor. To do so, puts them at the greatest risk of physical injury and danger. If you become a charter member, you can try it out for 2 weeks for just $4.95! Plus, the Shidoshi is including one of his full training programs (a $397 value) as a bonus to those who enroll while the Charter Member program offer is still happening! You'll find articles relating to the ninja arts and the self-defense method that is uniquely ninjutsu - from a master teacher with real-world self-defense experience! You'll also receive a free copy of the Shidoshi's new ebook, "Becoming The Master!" and get the chance to register for special training opportunities - both online and in our yearly seminars and Ninja Camps. Click here to get started! For more information about ninjutsu, its relationship to the overall Warrior Concepts Life Mastery Program, and how it can help you to be safe in a wide variety of situations (including womens self defense, child safety, and more), clickhere. Ninjutsu, or Ninpo as it's known in its higher form, has a deeper, metaphysical side rooted in its connections to the esoteric mind-science systems of the East. 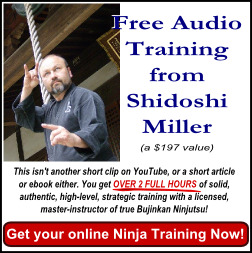 Get the books and videos by 10th degree Bujinkan Shidoshi Jeffrey Miller. 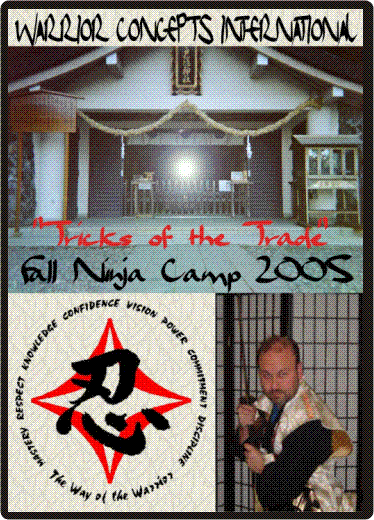 Click here for information about the Warrior Concepts Official Ninja Training Camp Videos on DVD!